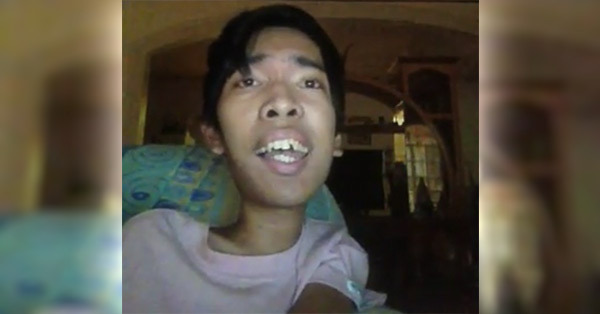 "Just be yourself no matter what" is the motto of this inspiring person with disability (PWD) who sang 'Flashlight' with Jessie J in a viral video. His name is David Ola Mendoza, a 21-year-old online sensation from Alicia town in the province of Isabela. According to concerned netizen Coleen Sanchez, he is suffering from a genetic disorder called spinal muscular atrophy (stage 3). This condition, which affects the control of muscle movement, is "caused by a loss of specialized nerve cells, called motor neurons, in the spinal cord and the part of the brain" that is connected to it. "The loss of motor neurons leads to weakness and wasting (atrophy) of muscles used for activities such as crawling, walking, sitting up, and controlling head movement." Sanchez said Mendoza is a big fan of Kapuso star Aljur Abrenica. The two were supposed to meet during a mall show at Robinsons Santiago City in September last year but the PWD wasn't able to come due to some circumstances. The actor wanted to go to his residence for a surprise visit. Unfortunately, they failed to contact Mendoza's brother. This time, Sanchez sought help from GMA's top-rating magazine show "Kapuso Mo Jessica Soho" (KMJS) with the hope to finally fulfill Mendoza's dream. His video already garnered more than 45,000 views on his timeline alone. It's also been watched over a hundred thousand times in several Facebook pages.